A tree growing to a height of 10 meters. Leaves are shiny, oblong to oiblong-lanceolate, up to 20 cm long, 2-5 cm wide, pointed at the tips, with petioles 1 to 1.5 cm long. Flowers are greenish-yellow, fragrant, 2 to 2.5 cm long, occurring in twos or threes on lateral peduncles. 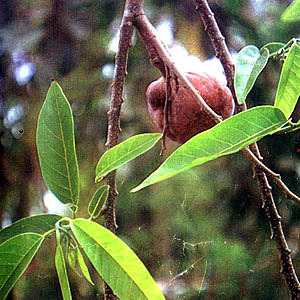 Fruit is large, heart-shaped, brownish-yellow, about 8 cm or more in diameter, with pentagonal areoles on the outside. Skin is thin, covering a cream-colored juicy and sweet pulp. The bark yields an alkaloid of the aporphine type. The bark and seeds are high in tannic acid. The fresh leaves are antihelminthic internally and suppurant externally. The bark is astringent and tonic. Indigestion: Warm the leaves in open fire. Apply to stomach while still warm; use abdominal binder. Renew every 2 hours. Also used for babies and children. The powdered bark used for dysentery and diarrhea. Fruit is antihelminthic; the dried unripe fruit is astringent and used for diarrhea and as vermifuge. The roots used for epilepsy. Fruit used in the New Year tradition of “bilog-bilog” for good luck – a bowlful collection of fruits (anonas, mansanas, ubas, pakwan, pinya, bayabas, etc) with other sundry items like cotton, salt, and coins. This entry was posted in List of Medicinal Plants in the Philippines and tagged anonas on March 6, 2009 by Pinoy Herbs.